Devilishly good tips, recipes and products for the healthy you. This is a gluten-free version of a cake my grandmother used to make for Shabbat and holidays. It’s a sponge cake, made very light and airy with beaten egg whites. This cake is not only gluten free but it’s also dairy free, making it a great dessert for Passover. Orange zest and a bit of orange juice provide the added flavoring. The tricky part in making it with almond meal is that the amount of wet ingredients had to be reduced from the original recipe. 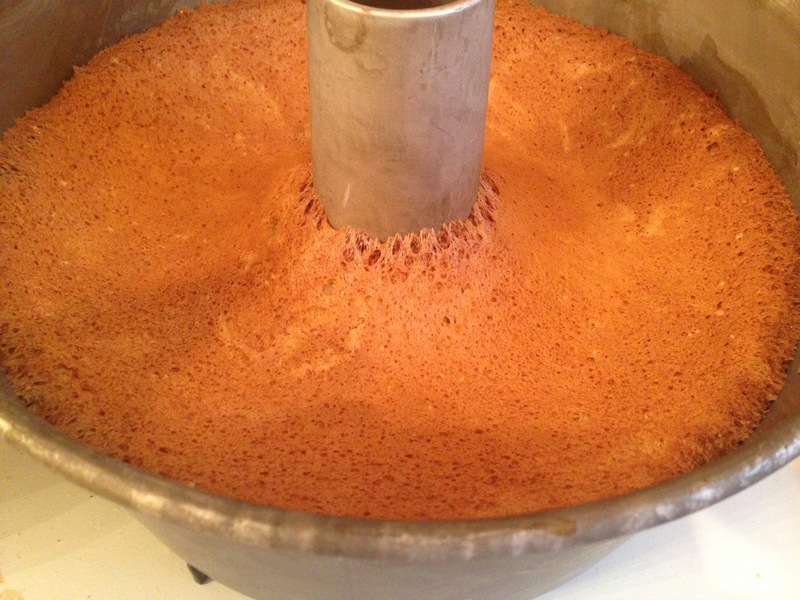 I used fewer egg yolks and orange juice than what I would use to make the traditional sponge cake. I tried making the cake with varying types of almond meal from course to fine. I found that fine almond meal absorbed the wet ingredients better. 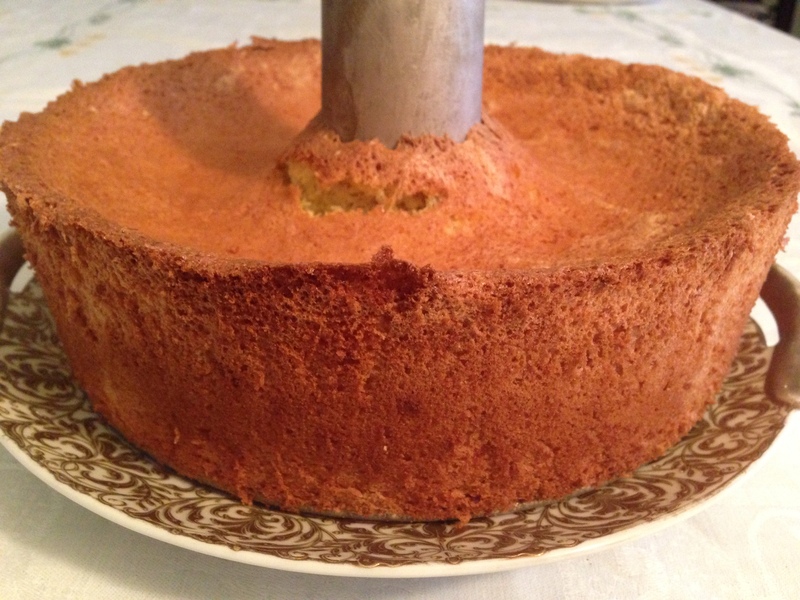 Traditional sponge cakes are made in a tube pan, and I baked this one in my grandmother’s tube pan. The key in making this cake is to really whip the egg whites until they are thick and frothy and then add a few teaspoons of sugar and keep whipping until it’s absorbed so the egg whites become glossy. Reserve the egg whites and then in the same mixing bowl add the yolks and whip for a minute then add the sugar gradually until the sugar is completely absorbed into the yolks and the mixture is glossy. This will take 5-10 minutes, depending on your mixer. The color of the egg yolk-sugar mixture will turn a mustard color. To the yolk-sugar mixture, add the juice and zest and mix for a minute. 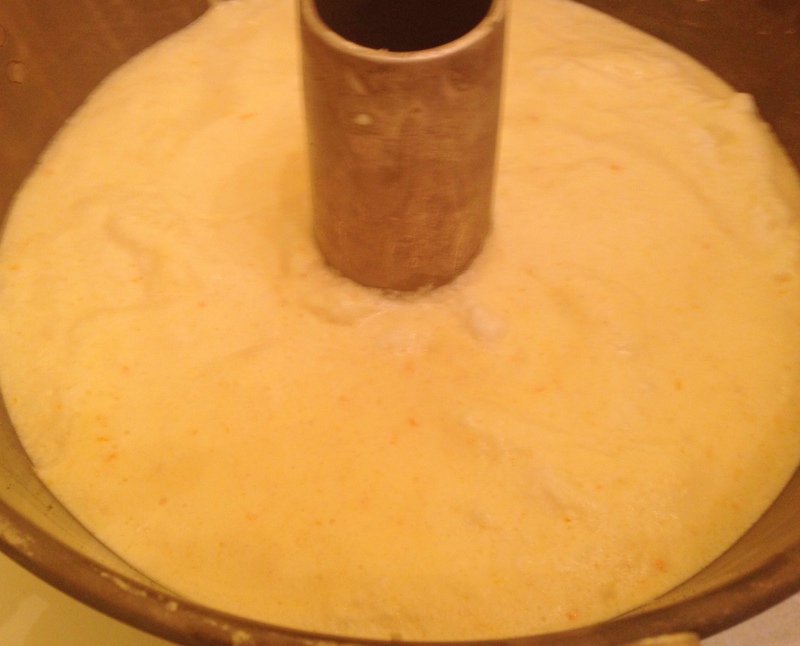 Then fold in the egg whites, one quarter at a time, and then pour the mixture into the ungreased tube pan. Tap the bottom of the pan to get rid of any air bubbles and place in a 350° pre-heated oven for 50-60 minutes, until a fork comes out clean. The trick to keeping the shape, height of the sponginess of the cake lies in turning the pan upside down over the neck of a bottle (I use a wine bottle) let it stand until the cake is cool, about an hour. Beat egg whites until stiff and frothy. Add 4 teaspoons of sugar, one a time, and continue to beat so the sugar us absorbed and the egg whites are silky and glossy. Remove egg whites and reserve. Using the same beaters and bowl, beat the yolks on medium-high speed and then add the remaining sugar and beat until the sugar is fully incorporated and the mixture is glossy – it will take about 10 minutes or so and the color will be a mustard yellow. Then add the juice and zest and then the flour. Mix until incorporated. Fold in the egg whites 1/4 at a time. Pour into an ungreased 10″ tube pan. Pat bottom to remove any air bubbles. Place in bottom rack of 350° pre-heated oven and bake 50-60 minutes, until a fork comes out clean. Take the cake out of the oven and invert it on a wine bottle to keep the elasticity until the cake is cool, about an hour. 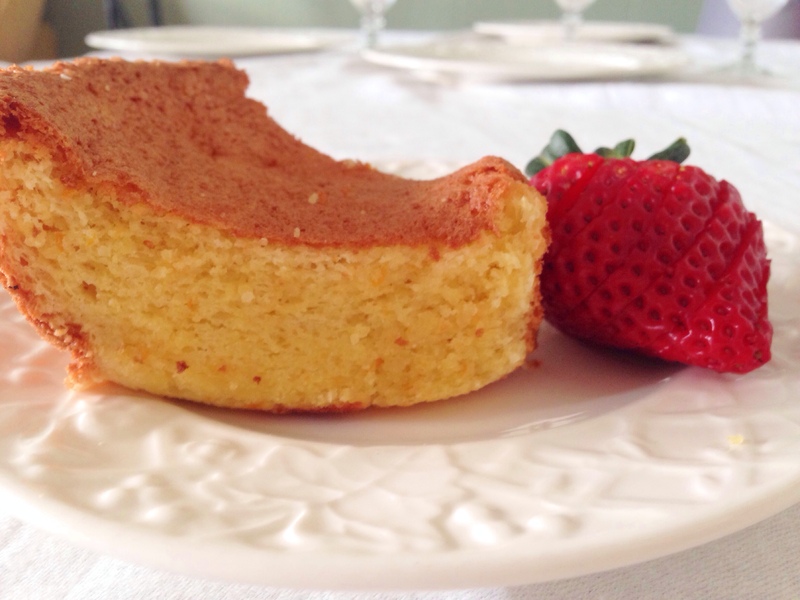 This entry was posted in Blog, Recipes and tagged Almond Sponge Cake, dairy-free, gluten free, Passover on March 30, 2014 by Leslie. Laura on Wine Braised Short Ribs: For 15% Naughty Living!